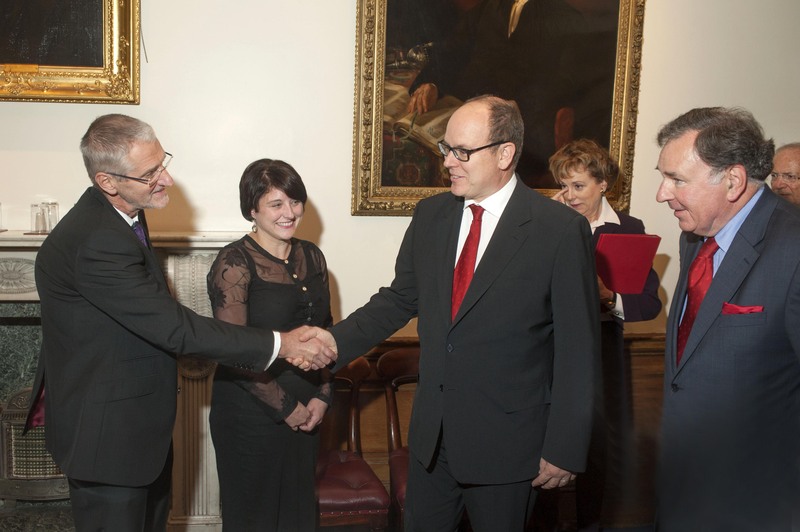 Rachel Hosker, Archivist CRC, meets Prince Albert II of Monaco. 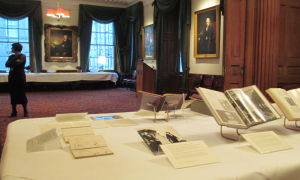 Dr. Graeme D. Eddie, Assistant Librarian Archives & Manuscripts CRC, looks on (16 October 2014). Today, His Serene Highness Prince Albert II of Monaco visited the Edinburgh Centre for Carbon Innovation (ECCI), and met the Director of ECCI and staff from the School of Geosciences at the University’s remodelled Old High School in High School Yards . The evening before – Thursday 16 October 2014 – a number of items from the Centre for Research Collections (CRC) were displayed before the Prince when he attended a reception at Old College, Edinburgh University. 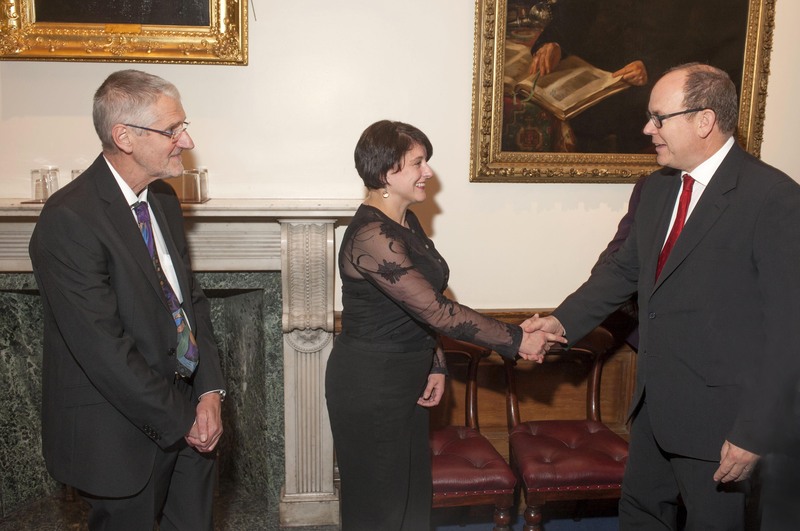 Dr. Graeme D. Eddie, Assistant Librarian Archives & Manuscripts CRC, meets Prince Albert II of Monaco, Rachel Hosker, Archivist CRC, and Professor David M. Munro look on (16 October 2014). The Prince was given a private viewing of the display just before the Thursday evening reception and was accompanied by, among others, the University Principal, Professor Sir Timothy O’Shea, and Professor David M. Munro OBE, Ph.D of the Royal Scottish Geographical Society and a member of the Technical and Scientific Committee of the Prince Albert Foundation. 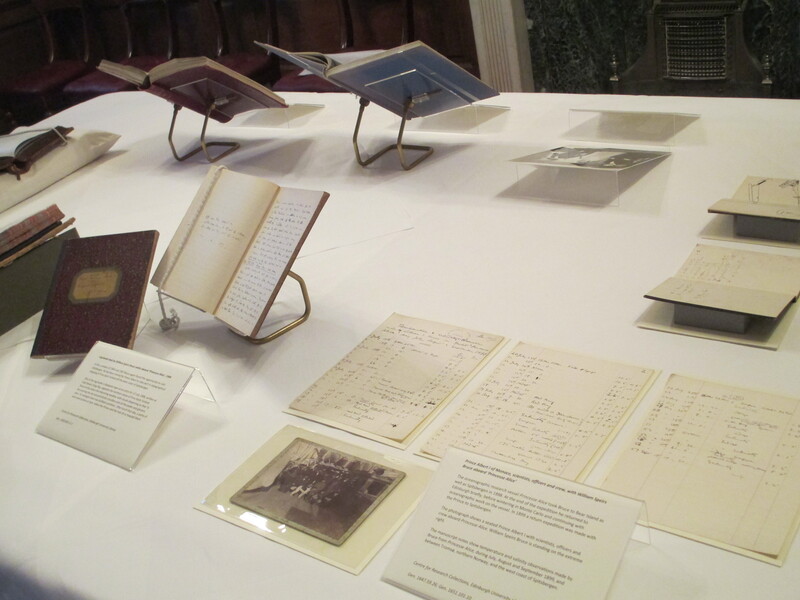 For the display, items from the William Speirs Bruce collection curated by Special Collections were chosen to reflect the connection between the scientist and explorer William Speirs Bruce (1867-1921) and the Prince’s great-great-grandfather Prince Albert I of Monaco (1848-1922) who was a renowned oceanographer. 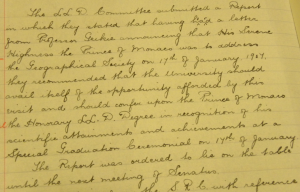 Items from Edinburgh University Archives were shown too, and these described the award of an Honorary Doctor of Laws by the University to Prince Albert I in 1907. 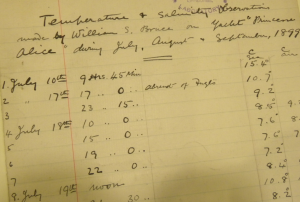 Ms notes showing temperature and salinity observations made by Bruce from ‘Princesse Alice’, during July, August and September 1899, and between Tromsø, northern Norway, and the west coast of Spitsbergen. William Speirs Bruce led the famed Scottish National Antarctic Expedition, 1902-1904, on his vessel Scotia. Prior to his southern expedition he carried out research in the Arctic. He sailed the Barents Sea to Novaya Zemlya and Svalbard on the steam yacht Blencathra in May 1898, returning to Tromsø, northern Norway, in July. 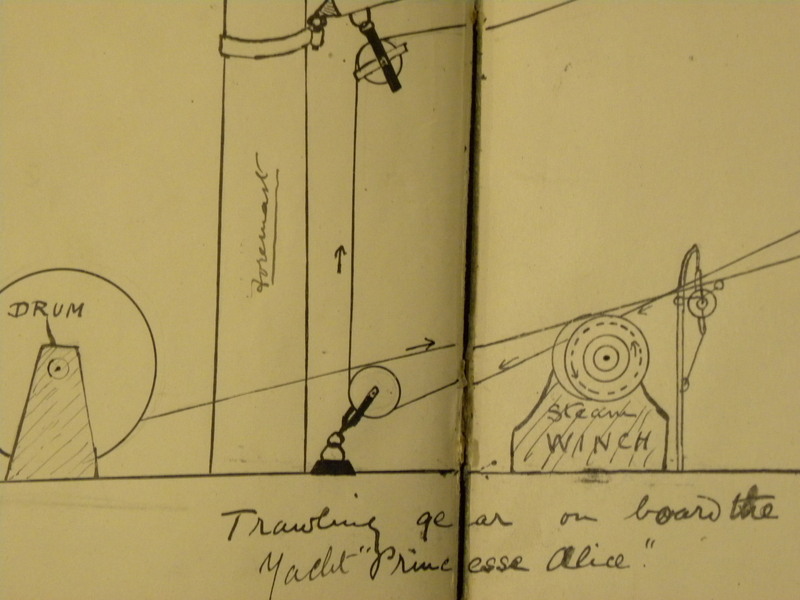 There he met Prince Albert I of Monaco (1848-1922) and was invited aboard the vessel Princesse Alice which had been constructed for oceanographic research. Bruce then accompanied the Prince on a hydrographic survey to Spitsbergen, the main island in the Svalbard archipelago. The Prince’s oceanographic research vessel took them to Bear Island as well as Spitsbergen. 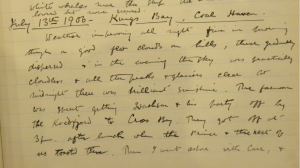 At the end of the expedition he returned to Edinburgh briefly, before wintering in Monte Carlo and continuing with oceanographic work on the vessel. 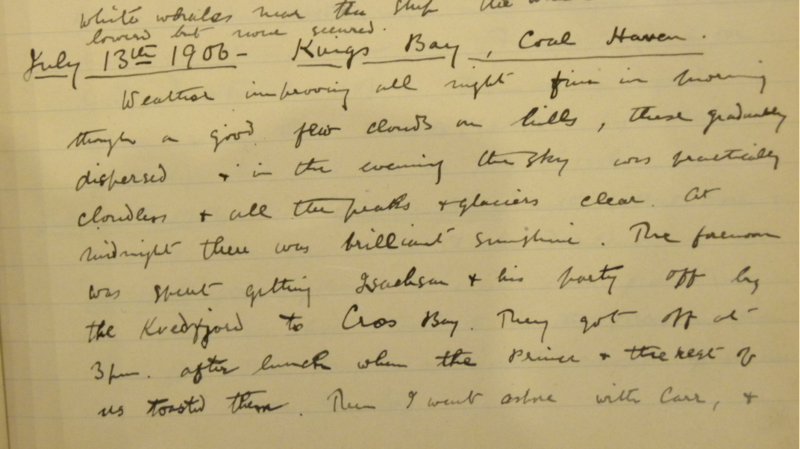 In 1899 a return expedition was made with the Prince to Spitsbergen, and during the summers of 1906 and 1907 Bruce again visited Spitsbergen. 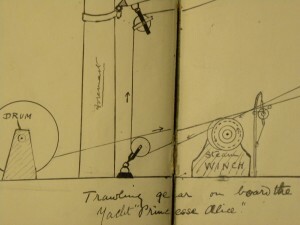 He had been invited by Prince Albert to take part in topographical mapping of Prins Karls Forland off the west coast of the island. 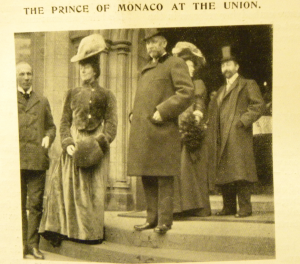 In January 1907, Prince Albert was to be addressing the Royal Scottish Geographical Society but prior to this, at the last meeting of Senatus for 1906, it was intimated that an honorary Doctorate of Laws (LLD) would be awarded to the Prince. This had been recommended to Senatus by the LLD Committee, triggered by information from Professor James Geikie (1893-1915). 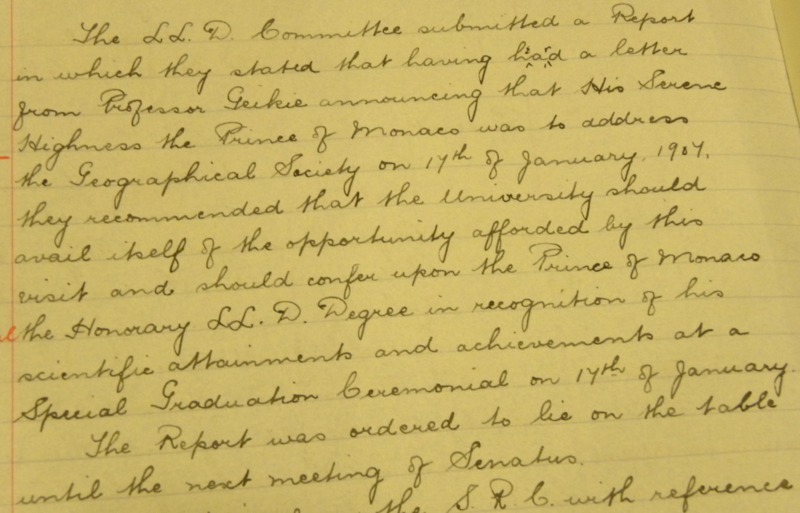 A Special Graduation Ceremony was planned for the same day as the visit to the Royal Scottish Geographical Society – 17 January 1907. 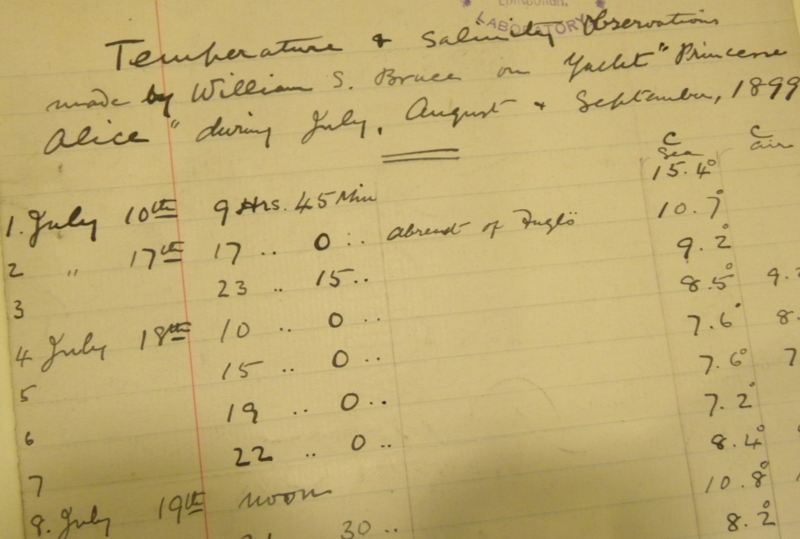 It was around this time too that Bruce established the Scottish Oceanographical Laboratory. The display set out for Prince Albert II of Monaco included items from the William Speirs Bruce Collection. 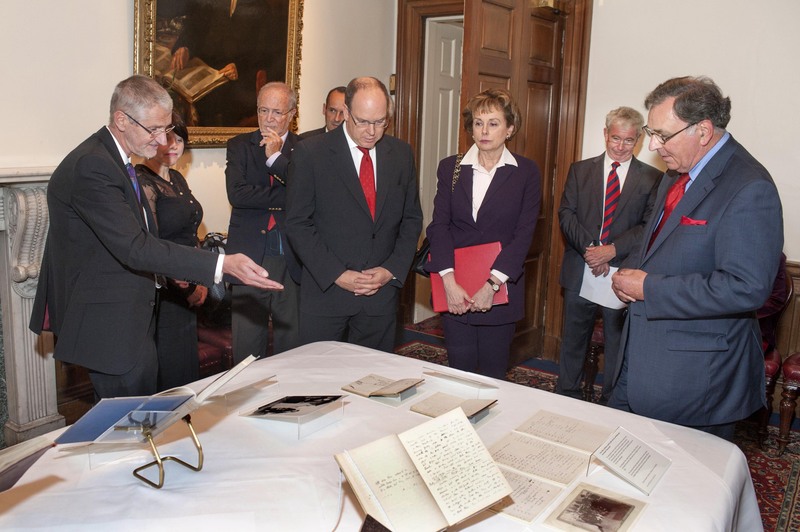 Dr. Graeme D. Eddie, Assistant Librarian Archives & Manuscripts CRC, introduces the display to Prince Albert II of Monaco, and his party. 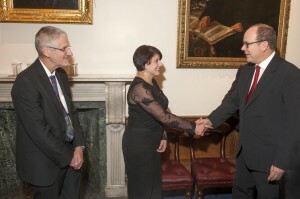 Rachel Hosker, Archivist CRC, Professor David M. Munro and the University Principal, Professor Sir Timothy O’Shea look on (16 October 2014). Born in 1958, HSH Prince Albert II is the reigning monarch of the Principality of Monaco, and the son of Prince Rainier III of Monaco (1923-2005) and Princess Grace of Monaco (1929-1982). He is the great-great-grandson of the oceanographer Prince Albert I and his first wife Lady Mary Victoria Douglas-Hamilton (1850-1922) daughter of the 11th Duke of Hamilton. 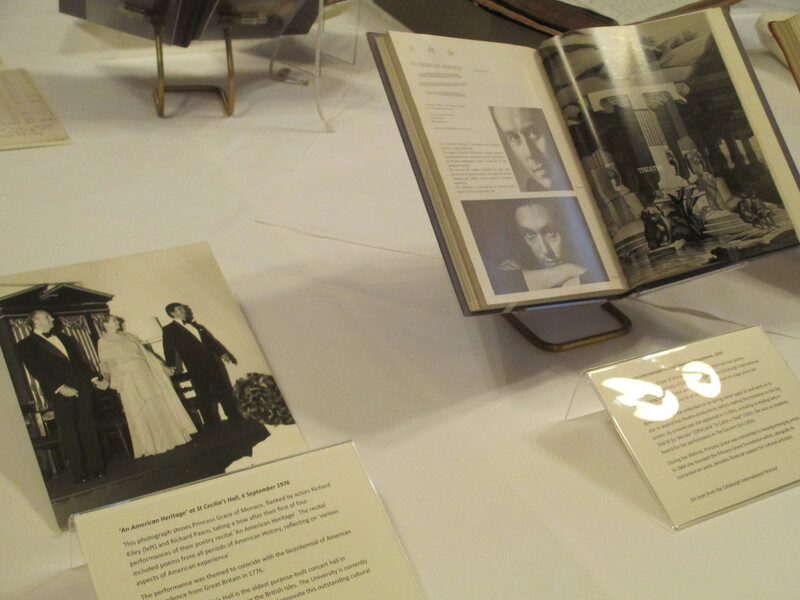 Items illustrating a performance by Princess Grace of Monaco at St Cecilia’s Hall in 1976, loaned from the Edinburgh International Festival and from the Herald & Times Group. After a brief introduction to the display given by CRC staff, Professor Munro very eloquently described the collection items to Prince Albert II, as well as the connections between Bruce and Prince Albert I. 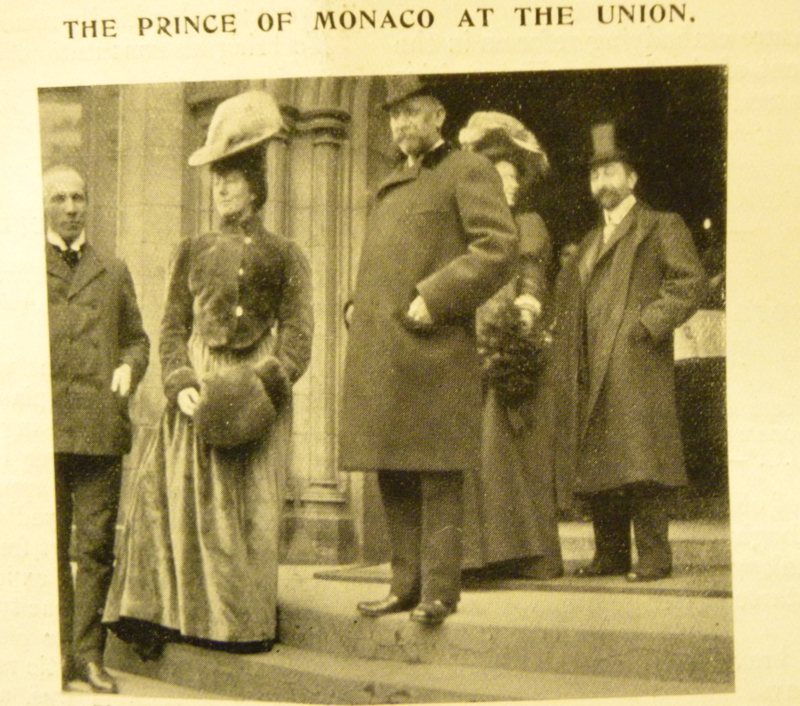 The Prince was heard to indicate that he hadn’t ever seen the photograph of his great-great-grandfather taken by Herbert Mather Spoor, and which had illustrated the 1907 report in The Student. The Prince also observed that when his mother had participated in the poetry recital An American Heritage performed at St. Cecilia’s Hall during the Edinburgh International Festival in 1976, he too had accompanied her on the visit to the city. Princess Grace together with actors Richard Kiley and Richard Pasco had recited poems illustrating American History in four separate performances in the 1976 Festival. Their performance was themed to coincide with the bicentennial of American independence from Great Britain in 1776. CRC staff in attendance in the Carstares Room, Old College, during the evening agreed that the items selected for the display certainly hit the spot with the Prince and with Professor Munro, and deemed the evening a great success (thanks due, not least, to supporting Conservation and Exhibitions colleagues). Display set before the Prince… Carstares Room and adjoining Raeburn Room, Old College. 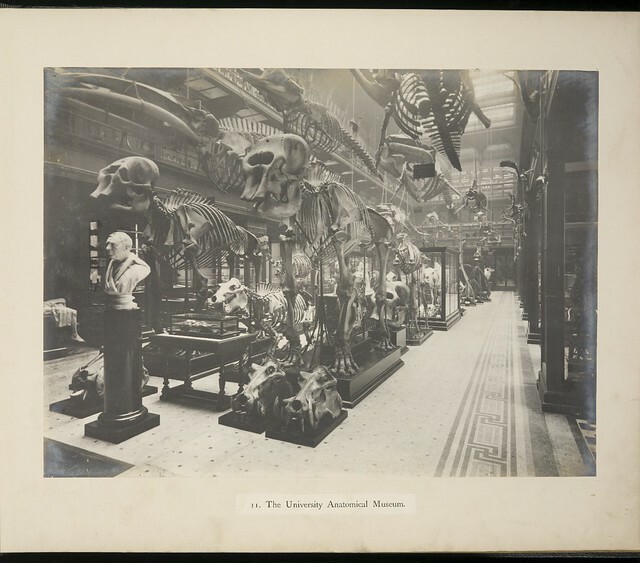 This entry was posted in Collections, Library and tagged 'Princesse Alice', 'The Student', Herbert Mather Spoor (1872-1917), Honorary LLD, Prince Albert I of Monaco, Princess Grace of Monaco (1929-1982), Scottish National Antarctic Expedition, Senatus Academicus, Spitsbergen, William Speirs Bruce (1867-1921) on 17/10/2014 by eddiegd.